Pickles are an integral part of Indian meals. I for one feel my meal is incomplete without the daily dose of curd rice and pickle. Though I love my pickles, I hardly try to prepare them myself. Every year I get my quota of pickles from my mom. So now you know why I haven’t posted even a single recipe for a pickle on my space. My grandmother, an expert in making a variety of pickles ranging from avakkai, maagai to kadugu mangai also prepared many instant pickles with raw mango, ginger, green pepper (pachha kurumilagu) etc. I love the green peppers preserved in lemon and salt. They taste absolutely divine. With the green pepper, she also prepares this mango ginger pickle, which was not one I liked. Recently I saw it in the market and got a whole lot of it wanting to have the pickle. No other go, had to oblige, so prepared it. But to my surprise, I found myself reaching out to the pickle jar very often. It was good to have it after a very long gap. 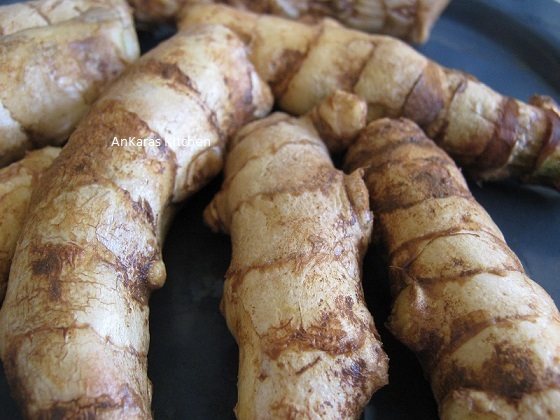 Mangai Inji or mango ginger is a root which is a look alike of the ordinary ginger. It smells like mango and has taste similar to ginger, however, the taste is not as sharp as ginger. Predominantly found in south India. Here is the how to prepare this instant pickle which tastes best with curd rice. Wash and pat dry the mango ginger. Peel and finely chop it. Finely chop the green chillies too. Transfer the chopped mango ginger and green chillies into a mixing bowl. Transfer into glass bottles and keep refrigerated. Stays fresh for 10 to 15 days when refrigerated.